Feel the love with this stunning bouquet of red, yellow, white and pink roses in red paper packing. 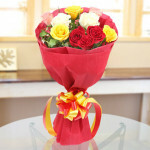 This long stemmed mixed rose bouquet is sure to delight loved ones with every single fragrant. This flower bouquet accentuated with vibrant greens will definitely make lasting impression on your special recipient.